Reigning world champion Tom Sykes has rounded off the world superbike pre-season in the best possible shape by setting the fastest time in a two-day test session at Phillip Island ahead of the opening round back at the grand prix circuit this weekend (February 21-23). Sykes, who in 2013 won Kawasaki’s first world superbike title since 1993, was one of 16 riders in the 25-strong pack who set their fastest time of the test in today’s opening session, as the mild track conditions allowed riders to really get down to some serious business. Sykes’ best lap was 1min 32.239secs, just a fraction outside Spaniard Carlos Checa’s best ever lap of the 4.45km circuit – 1:31.234, set in 2013. Sykes is now the warm favourite heading into round one action, although Phillip Island hasn’t been the happiest hunting ground for the amiable Briton in past seasons – and there’s a hungry pack just waiting to make his title defence a hard one. “I am happy with the results of these two days of testing at Phillip Island. In the last couple of days we have done a lot of laps to confirm the remaining test items, so to be fastest and be one of the most consistent riders as well, I have to be very happy with that,” said Sykes after the two day test. “Phillip Island has never been our main event, so to speak, so to be up there for pace already is very good. I know the conditions have caught a lot of people out already but I know we can now go to the race weekend with more of a clear understanding of what to do. Suzuki’s Eugene Laverty topped the time-sheets in Monday’s test session. Just 0.848 seconds separated the top 10 riders in the two-day test, with Suzuki’s Eugene Laverty – the day one pacesetter – concluding proceedings in second with a best lap of 1:30.513, followed by his ultra-impressive rookie team-mate Alex Lowes (1:30.528), who only circulated at Phillip Island for the first time yesterday. “It’s an awesome track. It’s a track that I have dreamed of racing on since I was a kid, watching Mick Doohan in the ’90s race around here and obviously Casey Stoner was awesome round here,” said Lowes, the twin brother of 2013 world supersport champion Sam Lowes. 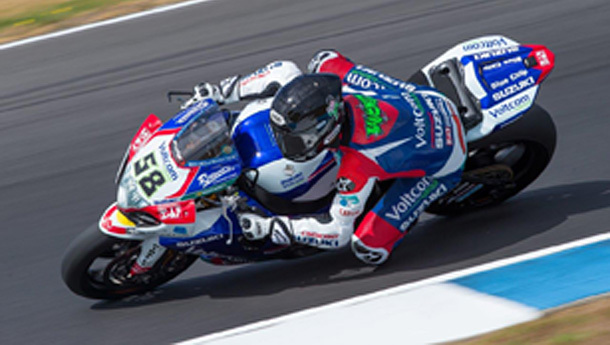 Rookie Alex Lowes (Voltcom Crescent Suzuki) has made a strong impression over the two days. Marco Melandri (Aprilia, 1:30.579) and Davide Giugliano (Ducati, 1:30.644) made it a quartet of marques in the top five, while four other riders dipped into the seriously fast 30-second bracket: Kawasaki’s Loris Baz (1:30.757), 2013 Phillip Island winner Sylvain Guintoli (Aprilia, 1:30.766), and Honda pair Leon Haslam (1:30.798) and Jonathan Rea (1:30.813). Rea and Sykes completed the most laps over the four 120-minute sessions, logging 128 and 134 laps respectively. Briton Chaz Davies (Ducati) was 10th fastest with a best lap of 1:31.087, ahead of the leading EVO machine of Niccolo Canepa (Ducati, 1:31.373). 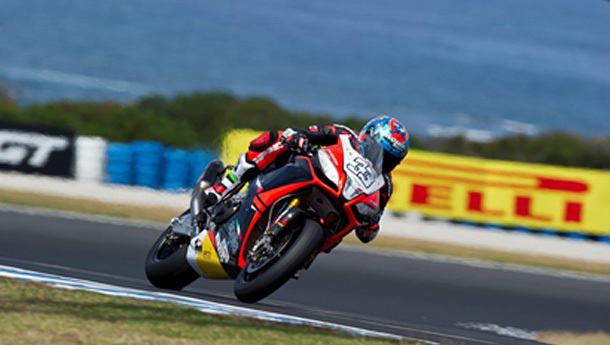 Marco Melandri campaigns the Aprilia for 2014. Eight EVO bikes were in action at the test, and other leading lights included Kawasaki pair David Salom and veteran Fabien Foret, who were both ahead of the fully fledged MV Agusta superbike of Claudio Corti. 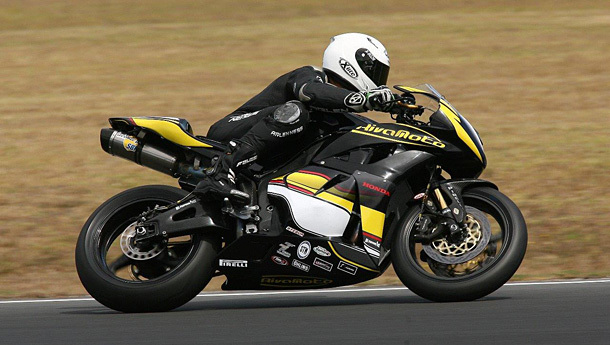 MV Agusta is new to the championship in 2014, as is Erik Buell Racing. EBR pair Geoff May and Aaron Yates made massive inroads on day two, although they still concluded the test in 23rd and 24th. There were few incidents over the two days, with 2013 FIM superstock 1000cc champion, Frenchman Sylvain Barrier (BMW), and Italian Luca Scassa (Kawasaki) already ruled out of round one action with fractured pelvises, while Michel Fabrizio (Kawasaki) remains in hospital as a precaution despite x-rays revealing no signs of injury. His participation this weekend is still up in the air. In world supersport, world No. 2 and red-hot championship favourite Kenan Sofuoglu was the fastest rider in every session, and ended the test with a best of 1:33.506, followed by American rookie Patrick Jacobsen (1:33.787) – another rider to lap Phillip Island for the first time — on another Kawasaki, with Michael van der Mark (Honda, 1:33.918) in third. 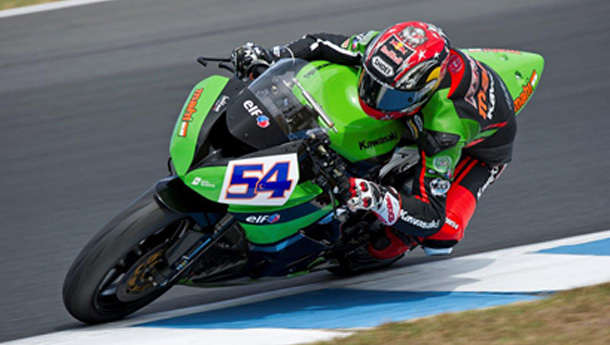 Kawasaki’s Kenan Sofuoglu has made his intentions clear after completion of testing at Phillip Island. Frenchman Jules Cluzel (1:33.984), back in world supersport after a year in world superbikes, was fourth on his MV Agusta after overcoming day one technical problems. He was ahead of world supersport debutant Ratthapark Wilairot (Honda, 1:33.987). Yamaha was well represented by Kev Coghlan (1:34.072) and Italian Fabio Menghi (1:34.233), who finished sixth and seventh respectively. Australia’s big hope Bryan Staring (Honda) made up three spots – and just over one second — on day two, stopping the clock at 1:33.733 to finish in 13th. 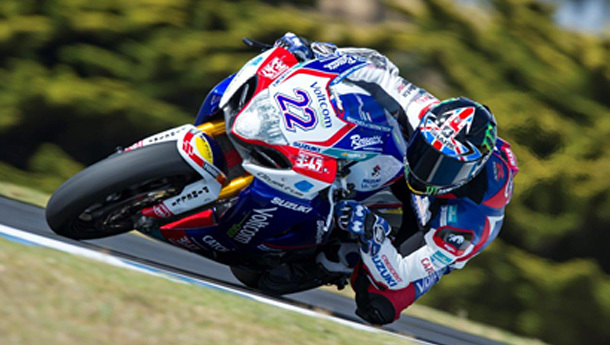 His compatriots Billy McConnell (Triumph, 1:35.351) and Ryan Taylor (Yamaha, 1:36.969) – both making one-off appearances at Phillip Island this weekend – were 19th and 25th respectively. 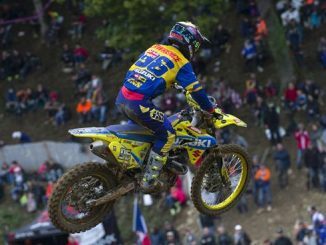 Bryan Staring finished in 13th position on his new Rivamoto Honda. After a two-day break, the riders in both world championship categories will return to Phillip Island on Friday for opening practice and qualifying ahead of final qualifying on Saturday and Sunday’s races – an 18-lapper for world supersport and two 22-lappers for the world superbike field.